This double pedestal dining table is sure to be the focus of your dining room with its big bold style. Customize the look of your new dining table by selecting the size, wood, finish, amount of extensions, feet and center base design. This Double Pedestal Newport will be the perfect spot for your everyday family dinners to huge Christmas celebrations with all the extended family. Your will enjoy lingering at this beautiful solid wood table. This table will fit in with most home decors depending on the options you select. If you are looking for a more country feel then go with the oak wood, claw feet and spindle or wheat center. If you prefer a more transitional style then go with maple or walnut wood with empire feet and bar or no center option. If you want a more elegant or stately style then go with cherry wood, empire feet and the royal or spindle center. 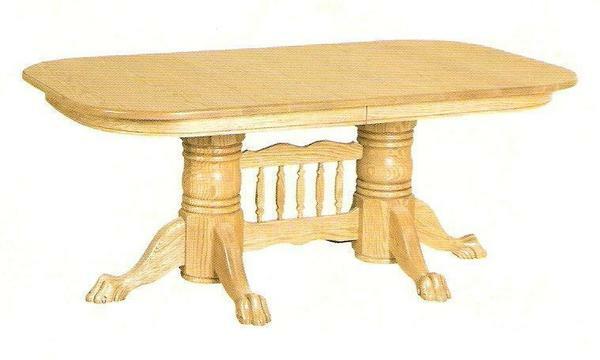 Call one of our Amish furniture specialists today to get an order started for the best double pedestal table!